With every Christmas quilt I make. and may all your mistakes be erasable! 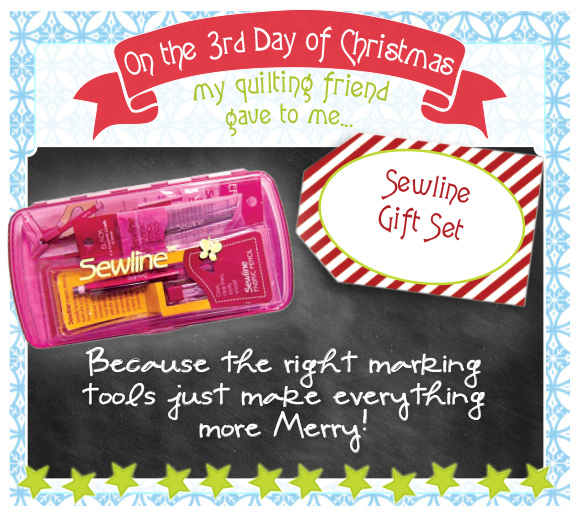 The Sewline Gift Set will meet all of your friends marking and unmarking needs! 360° Rotating Mechanism for 3 functions in One!! Lines are easily removed from most fabrics with the special Sewline Eraser or removed by dabbing with a damp cloth or washing. Simply rubof with the eraser or dab off with a damp cloth. Convenient way to erase pencil lines from fabrics. Pen style holder gives accurate control with clear view of masks to be erased simply click the clip end to advance eraser to desired length. This specially developed glue is colored blue and bright yellow to be easily seen and then it dries clear after a few minutes. Oh Santa, please leave this for me as I know you know I need pens and erasers. You know I have a stationery fettish and even though this stationery is for fabric, it is still stationery. Oh, the glue would just be perfect for my english paper piecing and the pencil for my stitcheries! Great! I keep looking at this set… would be great to have a neat portable set for sewing classes and craft camp… thanks Santa for the chance to win one. Love sewline, using all the time for my EPP hexies… I am running out so need Santa to bring me some more please! Oh, Santa – such a pretty set to take to classes. Dear Santa I have been a quilting Angel all year and you can see by the patchwork and applique I have been working on. Ooh, these look so useful. I don’t have anything like this at the moment and I think it would save me a lot of hassle with marking. The right tools for the job go right there with the right fabric,thread and pattern. This would be so helpful in making sure I’m on the right track of a perfect project. Thanks for the chance. I need this in my stocking simply because I am a HUGE fan of marking stuff and I hate the cheap marking pencils that are the only thing available where I live! Dean Santa, I am dreaming of all the wonderful crafts i can make with the right marking tools. Your help would be most appreciated. Love the looks of this set~ if you’ve got the right tools for any project, you’re way ahead of the game! Thanks for offering this! Wow. This looks like a great tool that I could definitely use. Oh, Santa…please pick me! I would love to have this in my stocking… Thanks for this fantastic giveaway! I need all these! Please!!!!!!! I do quite a bit of applique so the glue stick and tracers would be fab, I would like to do more intricate quilting designs though and I think the different coloured markers would be really useful- I’ve not found the right pen yet! I would love to win this! I have so many projects and I am always looking for the right tool to mark my lines. This looks perfect! I LOVE my Sewline pen and glue stick! I’d love a second set to travel around with me so I don’t lose my only ones. This is a great gift to receive and to give! Thanks for the giveaway. I haven’t seen this before and it’s looks great! I have lots of quilting to do and this would mark everything so well! thanks! Oh, Santa. You always know the perfect gifts to give. You know that I have signed up for a new applique BOM project. Oh Moda Santa, please leave me this…especially because my fabric glue pen just ran out! And you know that I have been a good little quilter this year! I really need this set! It looks great! I never have a marking pen when I need it—my children seem to confiscate all of my marking tools! It would be perfect for so many things! I love their glue sticks! I would love to have this set! I would love this as I never seem to have the right marking tool. I am tired of marking tools that don’t work, dry up shortly after opening, and generally disappear when I need them most. I have heard great things about Sewline and would love this nice set in my stocking! Such a great gift to have! Thanks Santa for the chance to win this! All of my wash-out markers are drying up – this would be a great replacement! I can assure Santa this set would get plenty of action in my sewing room! Between marking for quilting and doing stitcheries! I follow! I’ve never seen one of these before – it looks so useful! Oh boy, this is a great one! I need this because I have not less than 15 different applique projects going on right now (all Moda fabrics, of course). There’s not one thing in that little Sewline kit that I can’t make great use of! Please let me win it, I make lots of mistakes so I need the eraser, and really shouldnt be using Sharpies on fabric! I would love to see how the glue works for English paper piecing! Dear Santa, would just love to have this in my stocking – thanks. The right tool makes such a difference in my sewing! This would be terrific! I would love this tool in my sewing room . I have a big stocking waiting! What a neat tool! Love it. Since I follow your blog faithfully, Santa truly feels that with all the unique quilts I make for friends and family that I really do need the Sewline Gift Set in my life. This has been so much fun. Thank you. I really need these Sewline marking products in my stocking this year. I think they would make quilting alot easier to avoid mistakes or fix the mistakes I make. I want to graduate to some applique and how helpful these would be. Thanks. 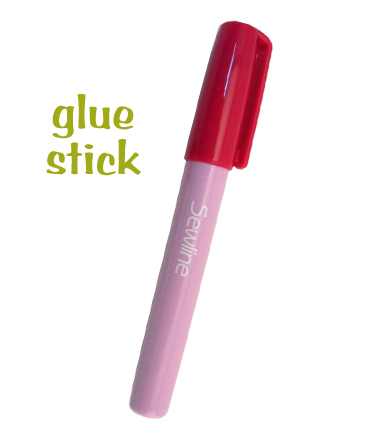 I love Sewline products–their glue sticks are a mainstay for my English paper piecing projects. This set would make a perfect stocking stuffer! Oh yes please, I need this because I end up either not marking and finding out that it’s not turned out as it should, or marking and then it not rubbing out – this sounds like it would solve my problems! Please Santa add these to my stocking. I would love to try this. I have not used marking pens yet. Perfect stocking stuffer for a sewer. Would love to have this in my stocking. Santa please leave this in my stocking as you know this would be perfect for my hand applique! I think Santa should leave this in my stocking because its already on my list! I am in need of a dark marking pen. I keep forgetting to pick one up when I go out shopping. I would love to win this. 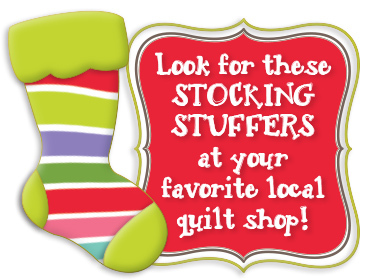 I would pass it on as a stocking stuffer to my SIL quilter! I would really like Santa to leave this in my stocking cause I have been very good this year….and this would be a great tool to help me with marking quilts! Santa needs to leave this for me so that I have some better marking tools! Santa knows how much I love RED and this set is awesome…….and again…….really I HAVE been a good girl!! Santa would love to leave this in my stocking because he know how happy I am when I am sewing! Oh sewline, oh sewline you keep my sewing straight & even! And when I’m done your marks are gone without screaming & scrubbing! With you in my stocking it’ll be another year of perfect stitching! Oh Santa, this would help be tremendously. Iam attempting to start quilting my own quilts. Please tell Santa I need every one of those items in the set! What a great collection of tools! Dear Santa, You know how scatterbrained I can be, so this would be a great way to keep my sewing tools all in one place!! P.S. I’ve been good….REALLY!! I’ve tried to be a good girl Santa! Dear Santa: my stocking is empty and I would love some sewline products. Thank YOU, Santa for this lovely give away! Why do I want this marking kit? Well… I do tons of hand stitching and I want to be accurate and on the mark! What better way then with Sew Line to help me!! Thanks for the chance to win this lovely kit! PS Of course I follow!! Santa, I am running out of marking supplies for when I quilt. I would love this set in my stocking. Would love for santa to leave these for me! My marking pens are drying out and it’s fun to try new things out. Santa, I am always looking for new marking ideas. Glue and marking materials? What’s not to love about that?!? Oh Santa, please leave me a sewing kit. I so need the glue stick and the marking pens.. Thanks for the opportunity to win. What quilter or sewist doesn’t need something marking pencils that WORK? This multi-tool looks awesome! I’m starting to branch out with some hexie work – this would be sooo helpful!! What a lovely little set! All those useful tools in one case – love it! Thanks for the chance to win! A great let of marking tools is a must for any sewing room. I’ve not heard of this tool before — it sounds fabulous! Right now I’m using broken pieces of my daughters chalk, eek! I think I’ve tried every marking tool on the market for the last 40 years – I’ve heard so many good things about this product that I have to try it! I so need this because I do not have proper marking tools. I have been searching and have not yet found one that I like. Dear Sewing Santa, I’d like my Mother-In-Law to win this, Ginger Greenway. After sewing and quilting for 70 years, she still needs to be kept on the straight and narrow! Thank you!! I would love this set in my stocking! I love that it erases your marks! My OCD loves it too! Santa needs to put this in my stocking cause i don’t have this! I really need these! Santa needs to put this in my stocking because marking has been a frustration for me and I love the sewline I have, but it only does one color and I hate changing the lead in it. This would be of a huge help to me! Oh Santa, as a beginner in quilting, an eraser is extra important. We need that extra chance to erase and try again. I won’t give up. I will keep on trying till I get it right. I love quilting.. I will keep on trying and this sewline will help me mark it just right and stitch it up beautiful! I would love for Santa to put this in my stocking, I have been eyeing this brand and have been wanting to give it a try:) THanks! This would be so convenient for taking to class! Would love to win this set of Sewline pens. I have one and this would keep me from changing out the lead so many times. Sew, SANTA pick me…. I would love to have Santa leave this for me because I can’t ever seem to find any of my marking tools! Moda Santa – I’ve been ever so good this year, well, sort of anyway, but I do really need better maaking pencils for my quilt making!!! Thanks! Sewline kit would be wonderful in my Christmas Stocking. This would truly help me in my future bags and quilts. I would love Santa to put that in my stocking. I have tried the pencil and it is great and would love to try the rest. And it is all in one great case. Sewline looks like the perfect marking tool. Santa please bring it to me to help me mark my stitching and appliqué patterns. This would make a great stocking stuffer for me. I never can find the right marker when I need it. I definitely need some fabric pencils. I hope I find some in my stocking. What a fun giveaway! I’ve always wanted to try glue stick applique and Sue Daley (Patchwork with Busyfingers) highly recommends Sewline. Fingers crossed. Dear Santa, you know I need that trio pencil for marking those scrappy quilts I love so much! This would be the perfect item to add to my sewing on the go kit. I wouldn’t have to always be hunting for the right marker to take along with me. that would be very nice, 3 possibilities in 1 pencil. Always the right one. I’m always scrounging around my sewing room for something to mark with. This looks awesome. Thanks for the chance. I love the erasable part of the gift set. Thanks for the opportunity to win it! Santa needs to bring this to me because I LOVE Sewline tools and haven’t been able to get more than one so far. I need to have the whole collection of them. Any quilter knows we must have an entire collection of anything right? Surely Santa knows this by now too and he should be nice enough to complete mine. No one puts anything in my stocking but me. Santa could fill it quite nicely with this little item. Hi Santa, with all of the marking I have been doing on my quilts, this would be a perfect stocking stuffer and make the job so much easier! I’ll leave some whiskey and egg nog out for you! Dear Santa…you know that I’ve been good this year & you know that I have been looking at this set all year!! There is nobody who will put this in my stocking except you!! Please pick me Santa! My stocking is so empty, and I plan to celebrate my 60th year doing hexagons and applique, so this gift set would be perfect! What a handy dandy gift. I’d love it! My fabric marking supplies always seem to have a way of disappearing, so I could really use some new supplies. Thanks for the giveaways! This would fit into my stocking so perfectly!! I’ve been really good and I would use this everyday. I would be ever so thankful.. I recently purchased one of these for myself and would love to win this prize to gift my daughter with it. 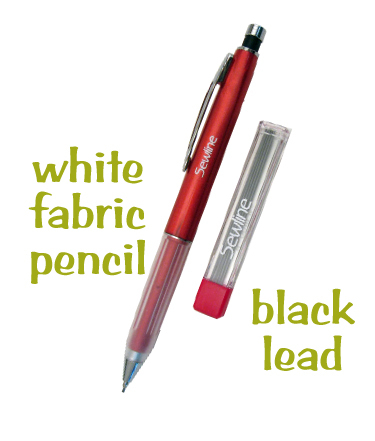 I love sewline products, and really want to try that 3 in 1 pen. I love to have this tools for my EPP project. Hi, I would luv to win those Sewline items. Thanks for the giveaway. Because I know you like to EAT! I sew need these…please Santa 🙂 Thank You and Happy Holidays!!! Please Santa leave this in my stocking. I am always losing pencils and pens in my sewing drawer and I can never find my pencil sharpener. If Santa leaves this for me in the nice tidy box I would actually be able to quilt instead of scrounge through my sewing drawers. Oh how I would love this, the perfect kit for applique!!! This is a wonderful box of goodies and I could really use it. Please draw my name. Dear Santa, I would love to find this in my stocking. All the right tools for a quilter and all in their own special case so they don’t get lost. Awesome. This is on my mom’s Christmas list! It would be wonderful to win this for her! Thank you for the chance! What could make quilting easier and more accurate with this gift? Love it……love Moda. This would make a wonderful gift for one of my sisters or a friend. Congrats to the winner. If you are reading this..wishing you a great day. This would be such a great tool to help with teaching the dtr-in-love to sew! Because I really need this kit! To have all those tools in one place would be wonderful. Wow! All those handy tools in one place! Woo hoo! What a nice present Santa! I want Santa to leave this in my stocking because I need a fabric marker I can correct! And I LOVE Sewline products. Santa know I could use one of these because it would let these “mature” eyes see the quilting lines better and easier to follow. I’d love to find this in my stocking. I’m a sucker for any gadget that comes along, especially if it makes my hobby easier. 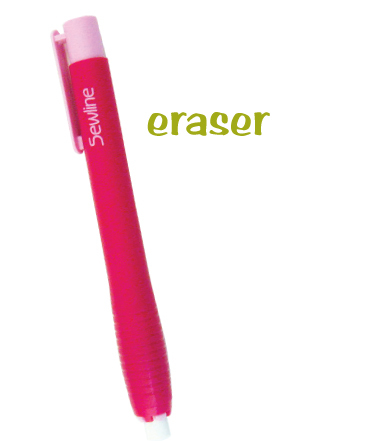 Dear Santa having my own, not used eraser and the Roating Mech tool would just be the greatest stocking stuffer ever. I would love to find this in my stocking because I have never found exactly what I am looking for in a marking gadget. This looks amazing. I would LOVE to get this box of tools – this is a great example of something I wouldn’t buy myself! Oh Santa, I would love this set so much! I had a glue stick and used it all up! This is such a nice set so please stuff my stocking! The perfect stocking stuffer for me. I love this set but probably wouldn’t buy it for myself. i enjoy sewline! have them by my machine, but, like all good things, they’re well used and will need to be replaced … how nice to win a whole set! thanx for the chance to do so. Oh Santa, I would so love to have these. I am using an old chalk pen that doesn’t really work and I have heard that Sewline products are so fine. It would be so nice to have some. I have been very good! I would love the chance to try these out… thanks so much! I love that this has white. I always am looking for a way to mark dark fabrics. I’ve tried many marking pens, this Sewline set looks wonderful! I wish I can have this!! I’ve sewn a lot of quilt tops, but I’m just beginning to do the quilting. These markers should help me out. Thanks for the chance to win. I have never had a marking pencil before and I just love things that come in little kit boxes. I would love this set as I don’t have many of these tools to use so Santa should really leave this in my stocking so I have a pen to mark with! Santa those sewline products would make my quilting world so much easier! I promise I’ve been good! I would LOVE to leave this for my mom. She makes amazing quilts and is tutoring me through my first one now. She also provides daily childcare for my daughter and has earned a little fun surprise like this! OMG love this little gift set, can I have 9 for my quilting group. Must get out more and explore! I am sewing fleece hats for Xmas gifts and these would come in so helpful! Love the sewline products! I would love to have these for starting the new year with a new applique project! I love my Sew-Line pencil markers and a whole gift set of all the products and a chance to try them all would be fabulous!!!! I LOVE Sewline pencils! I need this set to share with a friend who lost sewing stuff when her house flooded with Sandy. Psst, Santa, I’m getting ready to mark 2 quilts for my granddaughters for Christmas. This would be the perfect gift for my stocking. I was just trying to figure out how to mark some black fabric this morning! Dear Santa: I would love to get this one on my stocking, I know you want me to have prettier seams and matching lines, I could use a bit of help, Santa, this toolkit would be just perfect for that. Pretty please? I am always making mistakes and most markers I’ve tried don’t erase or wash out like they say they do. I would love to find this in my stocking! It sounds like the perfect gift for me! Thanks for the chance! I love some good marking tools and no one would even THINK to get this for me (well besides Santa). My stocking is waiting this goodies. I Love Sewline’s products and would be so happy to find this in my stocking! I really need this b/c I will use whatever is closest to me to mark things such as crayons and markers and they do not come out in the wash! I would love to put this in my daughters stocking. i’d love to have Santa leave this in my stocking bkz I never seem to have the right tools and make some big messes. I would love to see this in my stocking as I have no marking tools except a pencil. This would be perfect! I would love to have one of these sets! The Sewline pencils are wonderful marking tools! I have never tried the gluestick, and I think I need to…..
Santa I mlove new notions and this would be just the thing for me.I have never seen this and I would love to use it. Oh, my. This would totally help fuel my EPP passion. Please leave a Sewline marking kit in my stocking because I measure, measure , measure everything every time! I hate ripping out seams so I would rather be safe than sorry any day!! I already follow your blog. I need these tools because I never have just the right marking tool when I need it & have to take time to find something to mark with. And glue! Oh! Glue! How I need you for my curved piecing. I would like to win because this gift would help me not make mistakes, or when I do, it could help me correct them! Oh wow! I would love this gift. I just moved countries and I’m sad to say I’m starting from scratch with my crafting supplies. This would be the BEST start 🙂 Happy holidays! I would love this in my stocking! I am in great need of marking pencils. I have gone through many and have yet to find one I love. Dear Santa, This would be a wonderful surprise in my stocking as I haven’t found a perfect marking system yet! Thank you! This would make a great addition to my quilting tools. Hope Santa pulls my name out of his hat. Thanks…. I would love Santa to leave this in my stocking so I can mark up all those quilts I have planned and bought the fabric for! I have been eyeing this line for a long time and Santa is just the perfect person to bring it to me! I love using the Sew Line products. I use them while paper piecing (the glue stick), the colored pencils for marking stencils for machine quilting. One of my daughters is now quilting, she is 25 and getting married just after Christmas. I know that she would love to have these in her Christmas stocking. Always looking for new-to-me marking tools. With an eraser. I have been a good girl this year even if my attempts at marking haven’t been so nice. If you leave this system in my stocking, I promise my markings will be as a good as me! Santa, Baby, I can use this little gift in so many ways!! I love sewline goodies. It would make me very happy to win this…grin. As a beginner quilter I am always in need of great quilting tools. I am a follower of your blog. I would love this in my stocking so I could write a thank you note to Santa. After many years of sewing hiatus, I am DETERMINED to take the time to do what I WANT TO DO! This means I must replenish my sewing supplies…and I would be tickled pink to find this in my stocking on Christmas Day! Thanks Santa!! I’d love to have all the things in this little kit to play with. Oh what fun! I would love to have the box to keep my marking tools in since I can never find them when I need them. I want Santa to leave this set in my stocking because I love the Sewline Glue Stick, it’s great for tacking quilt bindings before hand sewing them, and the pencil would be great for marking those pesky little angles. Santa I really need this gift, you know how frustrated I’ve been when I’m marking my fabric. Nothing works right! OH, my gosh, Santa knows how I need this! My quilting/sewing would be improved greatly by any or all of these items! Thanks for the chance, Moda Santa! Santa, I would love to find this in my stocking! Marking quilts is always a challenge – this would make it much easier. I need Santa to leave this in my stocking because I have 4 quilts to mark before I can quilt them. Wow… this has everything one would need. I’ve heard some great comments about these products but have never had a chance to try them for myself. This might just be the opportunity I need! Thanks! I could really use some new marking tools for quilting and applique. I do a lot of paper piecing and the glue stick would be very helpful and the case would keep it all neat and ready to use. I am a beginner so I desperately need sewing supplies. I want Santa to leave this in my stocking because a quilter can never have enough great tools and Sewline’s are the best! I have the perfect spot in my sewing box for these! This sewing set looks so fine and would help me mark a thin line. Sticking my hand appliqué in place maybe even help me in class winning the great sewing race. My rhymes are bad even tho this year I’ve been good. I will end here wishing you much good cheer. HI SANTA! EVERY QUILTER NEEDS THESE HANDY TOOLS,YOU KNOW (SWEETLY)! Now this would really help out my sewing techniques. Thanks for the opportunity. This would be so nice to have as a take along when I travel to my daughter’s home. She does embroidery and I do counted cross stitch and am a beginner quilter. My marker died yesterday and this would be a great replacement! I need these items very much because I mark alot of my quilts to hand sew or machine sew. I always like to try out new products. Thansk for the giveaway. Me, me, me!! My nickname is “Inspector Gadget” and I LOVE Sewline products! all the right marking tools AND a case to keep them from getting lost or buried??? What more could a girl ask for???? 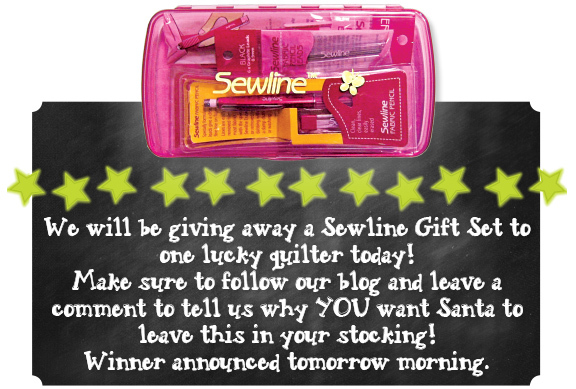 I’ve been wanting a Sewline marking pen and your blog made me remember to add it to my Christmas Wish List! Thanks! Love Sewline! What fabric fanatic couldn’t use these tools? This is awesome. Thanks for the chance to win. Maybe I would get some of my projects completed if I won this cute little kit. Please pick me Santa!! I will hang my stocking up so Santa can find it to drop the sewline set in. It will help me finish so many projects commonly called UFO. Thank you Santa for giving me something to help quilt. I have been good, or tried to be, please put this in my stocking, Thank you, there will be cookies Christmas Eve waiting for you. I can always use a new marking pencil. Also seam rippers. OH MY I have the singles but a trio sewline would be wonderful. Santa, I love to quilt and I have some projects that need finishing. This Sewline kit would be very helpful to me for my quilting. Oh, Santa!!! You would not believe how much I NEED this right now! Today I was marking a quilt, and I ran out of white marking pencil. I would love to have this for Christmas. Please? Pretty please??? I do make a few mistakes, Santa, so these marking tools with eraser would be the perfect stocking stuffer for me. And like all quilters, I’ve been good this year. thank you for the chance to win, “Santa”. I’m always looking for a great marking tool, and these look like they will fit the bill. I NEED this kit as when I mark my dark fabric my eyes NEED to see the white marks and when I mark my light fabric my eyes NEED to see the darker marks. But when I make mistakes my eyes don’t NEED to see any lines!!! Santa should leave me this because I need it! I get frustrated with my chalk. Santa, I would love the box set to use for paper piecing. It’s the perfect gift for sewers and quilters. Dear Santa, the Sewline Gift Set would be so perfect in my stocking. I try to be a perfectionist when I mark my fabric but sometimes it just doesn’t work. Thank you Santa for all your gifts! I would love this sewline gift set Santa. I absolutely love SewLine products and would love to give Mother a set of her own so she would leave mine alone!!! I am still trying to find a marking tool I like, the would be a great way to try them out! Finding the correct marking tools is so difficult. It’s been trial and error. I’d love to test this product out. I promise to stay on the straight and narrow with this gift. I may not always color inside the lines but I promise the finished product will always be something to be proud of! I would love it if Santa left this in my stocking because this is EXACTLY what i need to help with my FMQ! What a lovely little tool! I’ve been wanting one of these kits for the longest time. So please Santa, could you put it in my stocking! Because i need it for my quilting. I really really do. please santa!!! Ooh, Santa! I’d love a way to mark my sewing lines and quilting designs with something other than a wash out marker! I have a lot of sewing to do for Christmas, and the markers and glue would make this reindeer’s nose glow with delight! Thanks for the chance to win, Santa. I am a big fan of sewline products. Thanks for the chance. I think Santa should put this set into my stocking so I can use it when I’m hand-quilting..and doing LOTS of other stuff too! What a wonderful way to keep my tools together. I would love to win these marking tools. It would make marking all shades of fabric so much easier. I would love to win this as I find it so hard to find markers for fabric where I live. Thanks! I have been good, finished quite a few UFOs and surely do need some new marking tools. Thanks! I would certainly love it is Santa would leave me this Sewline kit…it would make marking my quilts for quilting so much easier and my quilting might look better! Becuase I am in need of just these kinds of notions! Looks great! I am always losing my marking pencils so this is a great way to keep them all together. please Santa I would love something that doesn’t leave marks on my fabric thru can’t get out aargh ! Although I don’t normally admit to mistakes, this would be an easy way to erase those errors!! I’d really like to win this as I’m constantly looking for the best marking option for my fabric. I have the air-erasable marker and love it! I’d love to try all these other ones!